Thread: Police gear set up a bit od? "Could you please turn the rifle the other way, it looks better" ? Incidentally, does anybody who (did) 3 gun shoot rifle right hand, and pistol left? There are some people, like my brother, who do one -handed things left handed, but two handed things right handed. Maybe because of that spare mag mounted on the right side of the stock, likely more comfy carrying it that way. I just don't know. But look at her face. Looks like she is REALLY enjoying being humiliated, being forced to wear a head garb that marks her as a second class person. She woke up that morning an independent citizen with full rights including the right to vote, AND equal standing with men before the courts. Now she really enjoys having her female gender being made into a second-class joke, can't you just see that in her face? HUMILIATED. A fine example of how to treat women colleagues, making them look even a bit more subordinate than before. Last edited by Cordite; 27-03-2019 at 06:36 PM. Fair comment. Subjugation of women - sexual phobia , racism, religous perscution, or what ? 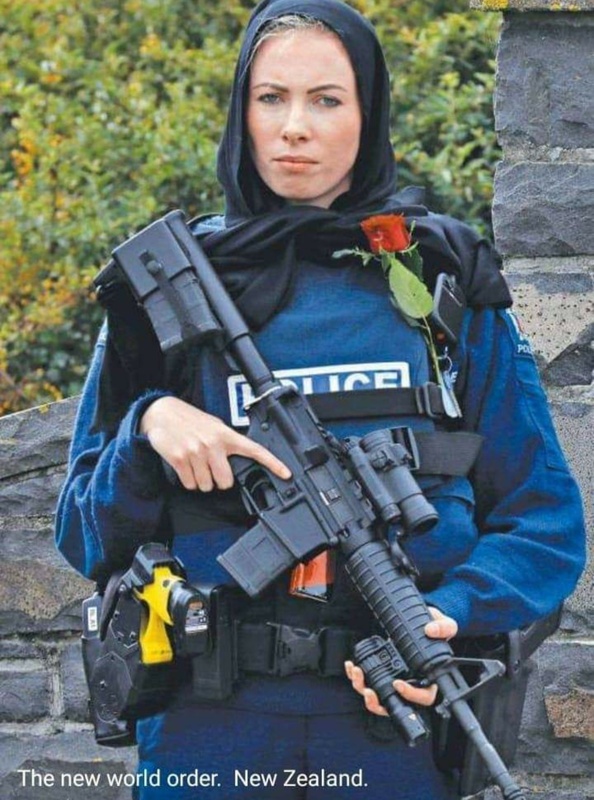 However I assume tgey are not above any NZ laws in such matters at any time so perhaps the loose scarf is ok apart from its possible risk in a battle situation. Or maybe she is sick of people taking pics of her, doing a particular job on a particular day she didn't want to do. Ever tried shooting a semi left handed? Hot brass down your neck, on your cheek, powder blowback? Lots of fun. Steve338, upnorth uplander, gadgetman and 8 others like this. I imagine the ones on Triangle Rd have been bored witless too. Blonde hair Blue eyes obvious choice considering the shooters motivation/Ideals...deliberately posed...probably not even a cop....What is her badge number? I do 2 handed things left and one handed right. Cricket left, squash right. But shooting handgun and rifle I do both right handed. Don't say it - I know... I was dropped as a baby. I picked up the habit of carrying a shemagh in my field kit from a forum member. On the Sudan/Ethiopia border one of the Christian boys came over and told me it was not polite, as it indicated I was Muslim and non-Muslims wearing/carrying symbols of Islam was insulting. I wonder if she has heard of the Saudi suffragettes? Police Report just came in.